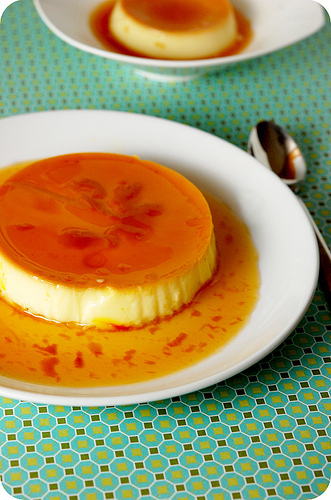 Behind the French Menu: Safran – Saffron. Saffron, the Most Expensive Spice in the World. Saffron on French Menus. 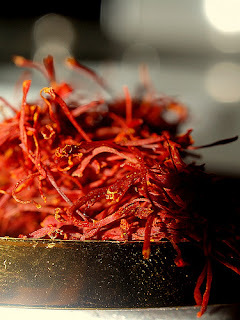 Saffron’s color, aroma, and the taste that it imparts to certain dishes are unique; even the few who do not appreciate saffron’s taste will appreciate the exquisite golden hue with which saffron infuses the dishes with which it is prepared. What makes saffron so expensive? 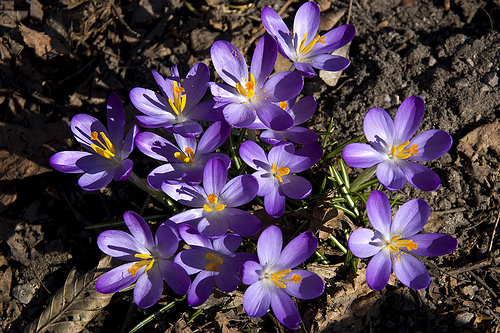 Saffron comes from the flower called the saffron crocus, with some 150,000 flowers needed for one kilogram of dried saffron. 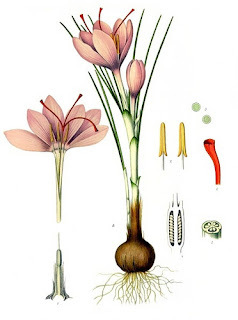 Inside every flower, there are just some 12 threads, correctly called styles and stigmas, which are the saffron spice. These threads can only be harvested by hand and that single kilo comes from about half an acre of flowers. The threads range from orange to dark red and are taken from the heart of the flower, any yellow threads included are tasteless and worthless. France has always grown saffron, but every year more and more is imported; when French saffron is being used, you may be sure that it will be indicated on the menu. Spain was once France’s largest foreign supplier but it is also now producing less; countries like Iran and Thailand produce more. Europe cannot compete with the cost of hand labor and saffron remains the most expensive spice in the world. Filet de Maigre Label Rouge, Émulsion au Safran des Ardennes - A filet of meagre, the fish, also called croaker or salmon bass, prepared with a thick sauce using saffron from the French Ardennes. The French department of the Ardennes is now part of the region of the Grand Est, previously the Champagne-Ardenne region. Just over the northern border is the region of the Belgian Ardennes; that is the site of the bloody Battle of the Bulge which was the last German offensive in Europe in WWII. These farmed meagre fish are raised in huge open nets, with plenty of space, in the clear waters off the coast of Corsica. To achieve France's red label for quality these fish are highly rated for their taste and raised in the absence of antibiotics and all other unwanted additives. 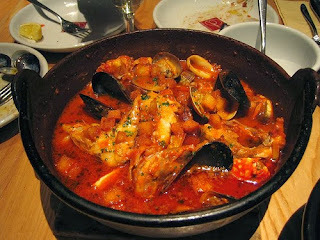 La Véritable Bouillabaisse – The authentic bouillabaisse. 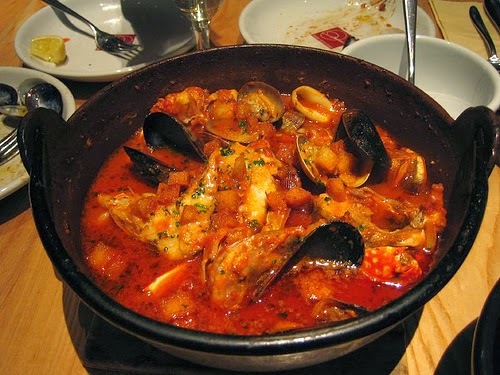 Do not order an hors d’oeuvre or an entrée if you are in a restaurant that serves traditional bouillabaisse; it is an enormous stew which includes at least four different fish prepared in a soup flavored with saffron. In a restaurant that wants to impress it will be served in two different stages. Bouillabaisse is the most famous of all France’s saffron flavored dishes. Noix de Saint-Jacques Poêlées, Beurre d'Agrumes et Safran – The meat of the king scallop lightly fried with a citrus butter and saffron sauce. Moules au Safran et Frites - Mussels prepared in a broth flavored with saffron and served with French fries, in the UK chips. Pavé de Turbot au Safran – A thick cut of turbot, the fish, cooked with a saffron based sauce. Risotto d'Orge Perlé au Poireau et au Safran – A risotto made with pearled barley flavored with leeks and saffron. (Pearled barley is barley that has had its hull and bran removed). Crème Brûlée au Safran - Crème Brûlée flavored with saffron. When you buy saffron for your home, there should only be dark orange to deep reddish threads, no yellow mixed with the red. Neither should saffron be powdered or inexpensive; if you see discounted saffron it probably is not saffron! The best saffron will cost over 8 Euros per gram, and anything under 5 Euros per grams should be viewed with suspicion. Despite most assumptions saffron did not originate in the Middle or Far East; botanists have determined that saffron developed on the Greek island of Crete. For the history of saffron see the websites of Gernot Katzer, Gernot Katzer’s Spice-Pages, and Eric Schoenzetter’s, Toil'd'Épices. I use these two very knowledgeable individuals to check on all the information and misinformation on the history of herbs and spices that I collect along the way. (The Toil d’Épice website is in French only but with the Bing and Google translate apps it is easily understood. (Catalan - safrà), (Dutch - saffraan), (German – safran), (Italian – zafferano), (Spanish – azafrán). Turbot - Turbot. Turbot, the fish on French Menus.